Sylvanian Families (シルバニアファミリー, Shirubania famirī) is a line of collectible anthropomorphic animal figurines made of flocked plastic. They were created by the Japanese gaming company Epoch in 1985 and distributed worldwide by a number of companies. Several animated adaptations have been made: Sylvanian Families (American TV series from 1987), Stories of the Sylvanian Families (British TV series from 1988), and Sylvanian Families (Japanese OVA series from 2007.) A Sylvanian family theme park is speculated to be in the works. In October 1987, the series spawned an animated series produced by DIC Animation City and TMS Entertainment, which ran for 13 episodes. The series was popular in the UK and Spain. The name of the television series based on Sylvanian Families was adapted in different countries. It was also shown in the late 1990s in the US on PAX TV. Later that same year, the success in these markets led to expansion into Western Europe, beginning with the UK subsidiary of Tomy acquiring exclusive rights for the brand in the UK. Tomy introduced Sylvanian Families into the UK market in 1987, and it quickly became a bestseller. By 1988, Sylvanian Families had become a major success around the world, winning the British Association of Toy Retailers award for "Toy of the Year" three years consecutively, in 1987, 1988 and 1989. In 1993, Tomy, who had been distributing the toys worldwide, lost the rights to the name "Sylvanian Families" in Canada and the USA. Tomy reintroduced the line under the new name Calico Critters of Cloverleaf Corners, now simply just called Calico Critters. The Calico Critters line is currently distributed in the US and Canada by Epoch Everlasting Play, LLC. By the late 1990s, Sylvanian Families had been discontinued in the UK, although since 1999, they have been reintroduced by Flair. Subsequently, Sylvanian families have been reintroduced in Australia and are becoming more widely available there. Tomy stopped selling Calico Critters, but a new company, International Playthings, now called Epoch Everlasting Play, picked up the line. In 1999, the toyline celebrated its 15th anniversary in Japan, with the opening of the themed restaurant Sylvanian Forest Kitchen (シルバニア森のキッチン, Shirubania mori no kitchin), which was operated and managed by Epoch. The restaurant not only served food, but also sold merchandise and toys based on the franchise. The restaurant closed in February 2011. In 2004, the franchise celebrated its 20th anniversary in Japan with the release of the Walnut Squirrel Family. In July 2004, Epoch announced a new attraction in Grinpa, a theme park managed by Fuji Kyuko. The attraction, originally called Sylvanian Village (シルバニアビレッジ, Shirubania Birejji) before it was renamed to Sylvanian Gardens (シルバニアガーデン, Shirubania Gāden), began its construction with Epoch's supervision. In 2005, the franchise hosted its very first live event titled Sylvanian Families Musical~The Large Commotion Eve Party! (シルバニアファミリーミュージカル～パーティーイブは大さわぎ！, Shirubania famirī myūjikaru ~ pātīibu wa dai sawagi!) which was hosted at the Gekidan Kogumaza Theatre. It was later released on DVD in 2006. In 2006, the characters in the toy line were chosen to be the mascots for the National Federation of Workers and Consumers Insurance Cooperativess national mutual aid. By the end of the year, the toys sold a total of 78 million units. In 2007, Epoch teamed up with Itochu, Nippon Columbia and Shogakukan to produce a 3DCGI Original Video Animation series based on the toy line produced by Kōji Kawaguchi and Yumiko Muriai and directed by Akira Takamura. All 3 episodes were released on June 20, 2007. According to Epoch, more episodes were planned, but these were never produced for unknown reasons. In the UK, Flair celebrated the franchise's 20th anniversary with a selected number of new items. The best selling was an Otter boat, and a reintroduced Dalmatian Family who now wore party hats that read "Happy 20th!". In March 2009, the series celebrated its 25th anniversary in Japan with the opening of the Sylvanian Gardens attraction in Grinpa. Managed by Epoch, the attraction features real-life replicas of the houses and buildings from the toy line as well as a museum featuring an exhibition about the history of the toys. The attraction also has a shop which sells items exclusive to the park. In 2010, the franchise again hosted two musicals, Sylvanian Families Exciting Musical (シルバニアファミリーわくわくミュージカル, Shirubania famirī wakuwaku myūjikaru) and Sylvanian Families Exciting Stage (シルバニアファミリーわくわくステージ, Shirubania famirī wakuwaku sutēji), which both became a staple on promoting the toys in conventions. On June 28, 2013, Flair confirmed that the rights for the toys in the UK will be transferred to the newly formed Epoch UK, and they began distributing the toys from January 1, 2014 onwards. Flair announced that they would stop distributing the toys on December 31, 2013. In 2015, a series of tableaux by the British artist Mimsy featuring Sylvanian Families being threatened by "MICIS" terrorists was banned from the "Passion for Freedom" exhibition. The entire franchise is set in Sylvania (シルバニア, Shirubania), a fictional village based on 1950s Great Britain. The majority of the families are all rural middle-class, with many of them owning localized but successful family businesses, or having white-collar jobs, such as doctor, teacher, artist, news reporter, carpenter or bus driver. They are designed wearing very 1950s-like fashion. They can live in large, multistory houses, or own dwellings based on the premise of a kind of holiday home. The houses are designed very realistically and can be decorated and redesigned. They can also indulge in many stereotypically middle-class leisure activities such as sailing or horse-riding, and often host garden parties or go on short camping holidays. The characters, grouped into families, originally depicted typical woodland creatures such as rabbits, squirrels, bears, beavers, hedgehogs, foxes, deer, owls, raccoons, otters, skunks and mice, and later expanded to other animals such as cats, dogs, hamsters, guinea pigs, penguins, monkeys, cows, sheep, pigs, elephants, pandas, kangaroos, koalas and meerkats. Most families consist of a father, mother, sister and brother, and continue to add family members from there on such as grandparents, babies, and older siblings. 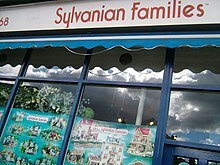 There are three animated series based on the Sylvanian Families world: Sylvanian Families, a syndicated series that premiered in 1987; Stories of the Sylvanian Families (1988), a British series animated in stop motion; and a 2007 original video animation series also called Sylvanian Families. In 2017 another two OVA series were produced along with a sets of 12 shorts, these were available on Youtube for a short time before being moved to Netflix. In late 2018, another set of 12 shorts were produced, these were moved to Amazon Prime Video in January 2019. Aside from the animated series, the series also spawned seven video games, all produced by Epoch. ^ Rhodri Marsden (2014-03-19). "Sylvanian Families: How folksy ways and wholesome values captured a global audience - Features - Health & Families". Independent.co.uk. Retrieved 2015-03-18. ^ Houlton and Short, p. 370. ^ Samantha Loveday. "Epoch confirms UK distribution of Sylvanian Families". Retrieved July 10, 2013. ^ Art and design – Artwork showing Sylvanian Families terrorised by Isis banned from free speech exhibition. The Guardian, 26 September 2015. ^ "Model society: at the Sylvanian Families toy convention". Telegraph.co.uk. Retrieved 2015-03-18. Houlton, Delphine; Short, Brian (1995). "Sylvanian Families: the Production and Consumption of a Rural Community". Journal of Rural Studies. 11 (4): 367–385. This page was last edited on 15 March 2019, at 21:57 (UTC).